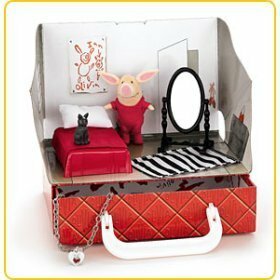 The Olivia Take-Along Bedroom Playset! On our way to visit Ryan at work, the girls and I stopped by Ollies (a discount warehouse) to snoop around a bit. I couldn’t help g(r)asping at the treasure that I found for $5.99 ($45 on eBay and $25 on Amazon.com!). Of course, the price-cut doesn’t compare to the adorability factor.